This book is a history of one man's voyage of life on the railways of Great Britain and the Continent. From a young 15 year old starting out on a railway career, he takes us through the early days of cleaning steam locomotives, learning the tasks of other manual grades, fireing on various locomotive types, before progressing to a driver. Via a series of stories and pictures, the author takes the reader on a journey of his life on the tracks of the south of England, then to France & Belgium via the early Eurostar services. The experiences of Dieselisation, Electrification, Modernisation and Privatisation, all are covered on the journey. After moving from an Inspector & Instructor to the Recruitment & Training of new train drivers, readers are given an insight into the system, with views expressed on the failures of long-term investment. As an active Trade Unionist the author gives his views on some industrial events of the 1970s, 80s and 90s before voicing his own opinions on where things have gone wrong within asle&f, the train drivers trade union he once fought for and was dedicated too. 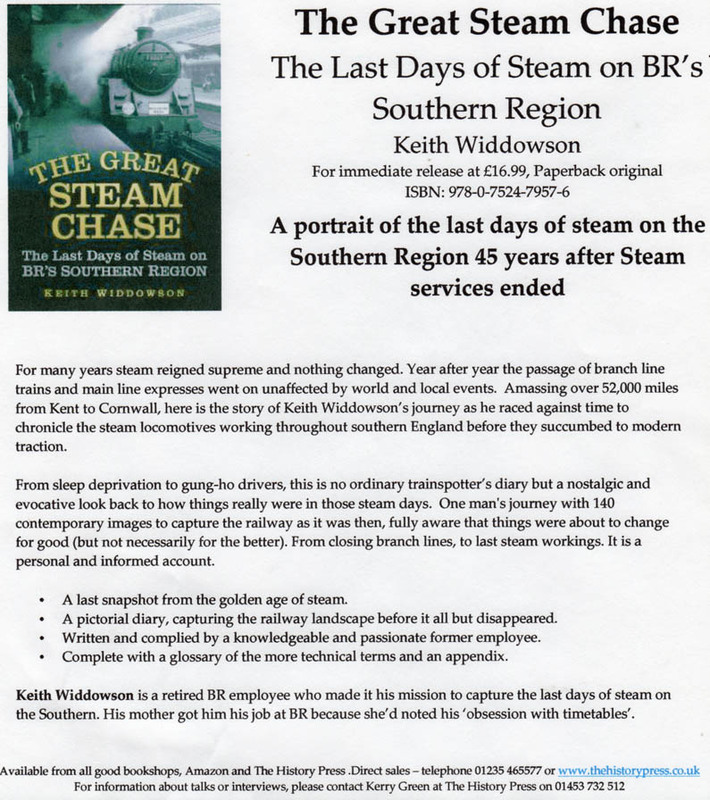 At the beginning of 1967 the writing was clearly on the wall for Southern Steam, with the intention of eliminating it altogether on the 18th June of that year. 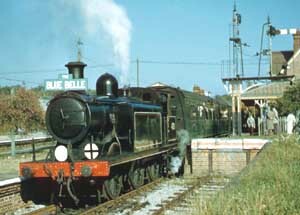 From the 2nd January, with the Brush type 4s working many main line trains including the “Bournemouth Belle”, steam was reduced to thirteen departures from Waterloo, three of which were in the early hours. From the 3rd April this was further reduced to just five day and three night time departures. However, by this time it was realised that due to late delivery of the new electric stock, the deadline for the demise of steam was put back to the 9th July and an interim timetable introduced from 12th June. 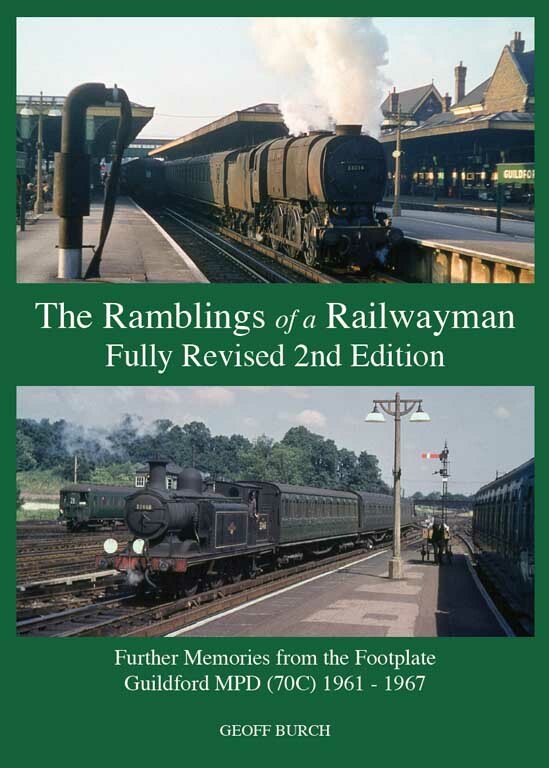 Following the success of Geoff Burch's first book 'The Ramblings of a Railwayman' published in 2011, the 1,000 copies sold out very quickly! Because of this, Geoff has decided to self-publish a Fully Revised 2nd Edition, lavishly illustrated with many previously unpublished photographs kindly supplied by Peter Trinder, the late Dave Salmon and Richard S Greenwood MBE. Only a limited number of books will be printed and each one will have a hand-embossed 'Rambling Railwayman Books 70C' crest on the inner cover (with the Author's signature if required) which will make each one especially unique. The book is now available. Now only £10 (plus £5 postage and packing) - While Stocks Last when purchased via Geoff Burch's website! This new book for summer 2017 is written and produced by John H. Bird, an acknowledged expert on the subject. There is a wide range of over 275 colour and black & white archive photos and is sumptuously printed on 144 glossy pages with hardback covers. Eight extra pages were added during production to cover some of the 50th Anniversary events in July 2017. 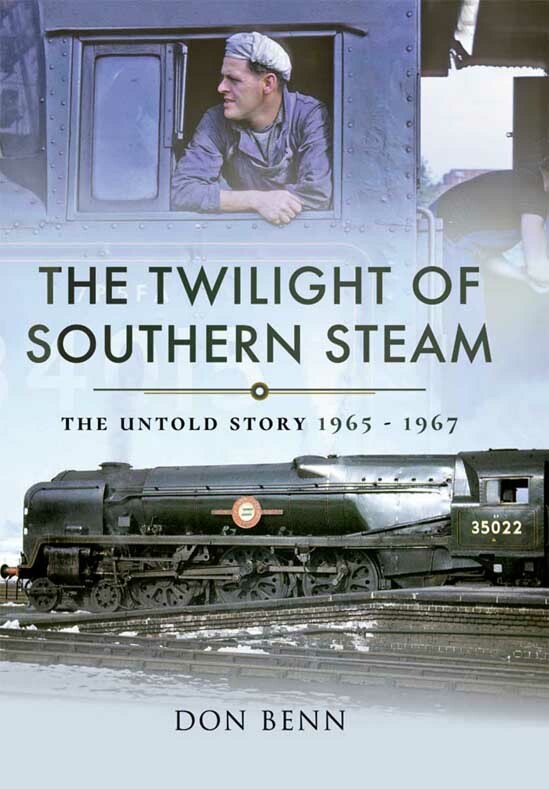 It features detailed coverage of every Southern steam locomotive that existed in 1967. There are special sections on railtours and foreign visitors, the Isle of Wight, the last weekend, the Salisbury and Weymouth dumps, scrapyard stories and the revival of Southern steam since 1967. Order direct from the publisher at Platform 14 , through Amazon, or at heritage railway bookshops including the Watercress Line's Alresford bookshop. When photographer Paul Cooper learnt in 1964 that the steam railway would soon be a thing of the past, he made it his mission to record as much of it as possible before it was lost forever. Travelling extensively over the Southern rail network he amassed an impressive photographic collection (many in colour) and in doing so created a remarkable pictorial archive of the last years of steam in Britain. Now, to celebrate 50 years since the last steam services left Waterloo, Paul has brought together the very best of these images, not just from his own collection but from other railway photographers of the era, in all around 250 images, the vast majority in colour and approximately 90% of which have never previously been published. 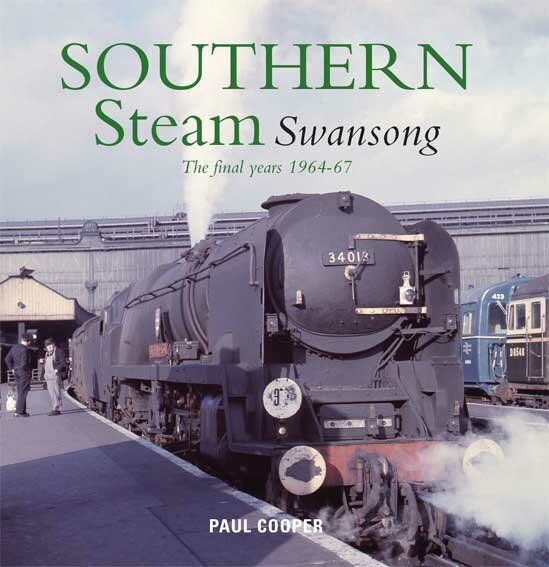 Starting at the open days at the Eastleigh works in 1964, Southern Steam Swansong takes the reader through the last three years of the steam railway as seen on the tracks, in the stations and in the sidings and workshops of the Southern Railway. More than just a collection of locomotive images, the places and people of the railway at that time are also part of the scenes, from the overall-clad drivers and firemen to the bowler-hatted commuter. 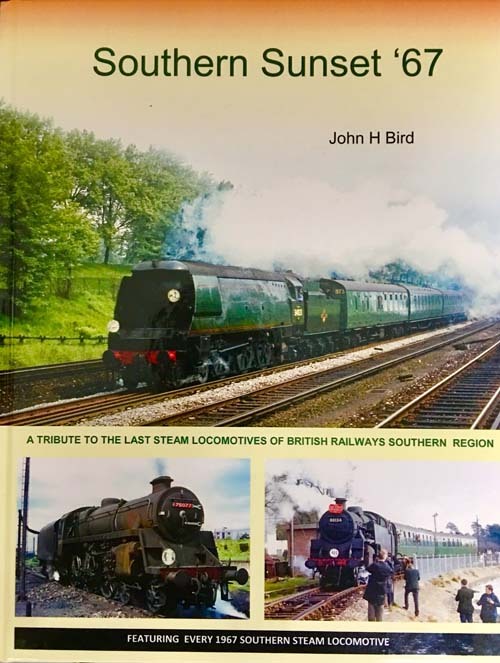 Supported by detailed captions which set the historical context of these evocative images, this is a book for the railway modeller, enthusiast and historian as well as anyone who remembers this era or just wants to know more about the swansong of the Southern steam railway. Crecy Publishing, 1a Ringway Trading Estate, Shadowmoss Road, Manchester M22 5LH. Quote the Steam World offer SW0717 to get it post free at £25 (instead of £27.50 +p&p). Order by phone 0161 499 0024 using crdit/debit cards or by email to enquiries@crecy.co.uk. Paypal can also be used on their website www.crecy.co.uk . 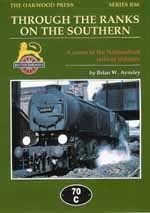 This book is first and foremost the story of the enginemen and their steeds which brought the steam era to an end on the Southern. It is therefore primarily about locomotive performance but enlivened by stories about how that was achieved and also about the band of young men who followed the exploits of men and machines, day and night over those last two years. It includes a substantial contribution from an ex-Nine Elms fireman and many anecdotes about the enginemen. The book contains about eighty train running logs plus records of lineside observations, detailed descriptions of the work covered by the locomotives and crews from the various steam motive power depots, copies of the actual duty rosters posted at Nine Elms, together with a unique collection of about 140 black and white and colour images taken in the 1965 to 1967 period covered by this book. It is the most comprehensive story of those last few years yet produced, and it is truly ‘The Untold Story’, a fine tribute to the enginemen who performed near miracles with their doomed and run-down fleet of locomotives, in the very different world of the mid-1960’s railway, unequalled anywhere else in Britain. The book is hardback, 10 x 7 inches, 357 pages, approx. 80 train running logs plus many other tables and 12 appendices. ISBN 1473863066 / 978 1 47386 306 4 published by Pen & Sword, 47 Church Street, Barnsley, South Yorkshire S70 2AS and costs £30 plus p&p from Pen & Sword E-mail: enquiries@pen-and-sword.co.uk, or from Amazon. Short online video featuring 34007 in action for the last weekend before its retirement for a major overhaul. With special help from the Mid Hants Railway, scenes on the footplate and even the driver's view are featured. What is Gricing? Gricing - is a term describing the activities of a diverse group of people whose hobby covers, amongst other things, the photographing, timing, and operation of steam locomotives or preserved steam railways. The book discusses railways from their relationship to music and culture through language and literature, and on to high art and low morals, from the earliest days of the Stockton & Darlington Railway to the advent of the High Speed train. Gricing is a warts and all view of the railway's role as a catalyst in the creation of the 'modern' world, all human endeavour is there, from saving the past to creating the future. Gricing looks at what the steam railway preservationists have saved, and what they haven't. It is based on the author's seven years as a British Railway footplateman in the days of the steam powered railway, more than six decades as 'a gricer' and four years of research in the archives of the National Railway Museum. The text is supported by more than 100 colour photographs, of engines great and small, on all types of trains at work on the preserved railways and the main line routes of Britain's national network. In support of the appeal to cosmetically restore locomotive No. 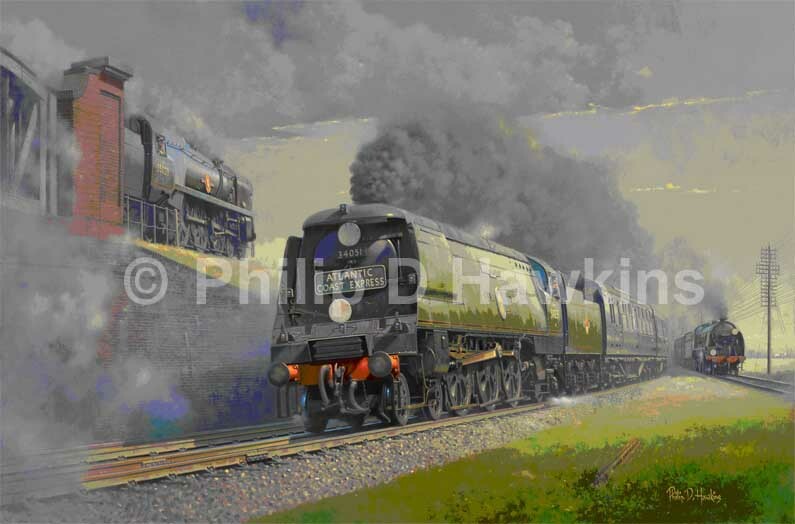 34051 'Winston Churchill' the Friends of the National Railway Museum have commissioned a new painting from Philip D Hawkins FGRA of three NRM locomotives at Battledown flyover on the south-western main line in the summer of 1960. In addition to the artist each print is signed by Richard Hardy, former shedmaster at Stewarts Lane and James Lester, fireman on 34051 'Winston Churchill' during the state funeral arrangements on 30th January 1965. This classic scene in the summer of 1960 portrays original Bulleid designed ‘Battle of Britain’ class, No. 34051 ‘Winston Churchill’, heading a portion of the ‘Atlantic Coast Express’ (‘ACE’) westward at Battledown, whilst at the same time overhauling ‘N15’ (‘King Arthur’) class No. 30777 ‘Sir Lamiel’ on a Bournemouth bound service. In the background an Up express to Waterloo is seen above passing through the girder built flyover hauled by rebuilt ‘Merchant Navy’ class No. 35029 ‘Ellerman Lines’. "As a 18 year old priv season London/Southampton ticket holder between 1965/7 I was privileged to have been aboard some spectacular runs with Nine Elms drivers at the helm. 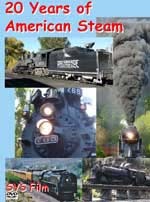 I have recently had published the above titled book detailing my adventures on SR metals during the final years of steam." 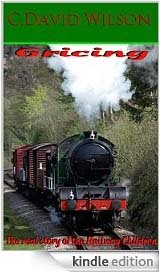 If you are familiar with the County of Surrey and have an interest in trains, then this silent DVD will allow you a fascinating look back to a lost period of Surrey’s railways. The programme is compiled from a broad array of still photos dating from 1867. Colour slides, black/white and colour prints illustrate almost every station and railway line within the modern boundaries of Surrey. In addition, where possible, archive silent 8mm colour cine film from the 1960’s and 1970’s has been included. The latter part of the steam era in Surrey is well represented in this DVD. Details about the photography are shown on captions within the programme. In addition a printed guide is enclosed, giving details of each picture and cine film sequence. Where known, the date, place, photographer and observations are noted to better explain the scenes. A narration is NOT included - the pictures speak for themselves! The DVD has been researched, produced and edited by Bob Bridger. The DVD can be purchased online from SVS Film, or in person from the Surrey History Centre, Woking, of if you are in Guildford, the DVD is usually in stock at Ben's Records in Tunsgate, and at the Castle Museum shop. It is also available in the Bluebell Railway Shop at Sheffield Park. This DVD features the restored 8mm cine film of Guildford driver Lew Wooldridge taken in the 1960's. As well as locomotives, depots and stations, over 80 staff members are identified in the film. If you are in Guildford, the DVD is usually in stock at Ben's Records in Tunsgate, and at the Castle Museum shop. For those of you who have a penchant for either the SOUTHERN, or an interest in the real workings on the footplate, or indeed both then 'YOU CAN'T TAKE THE STEAM OUT OF ME' is the title of a must have book. 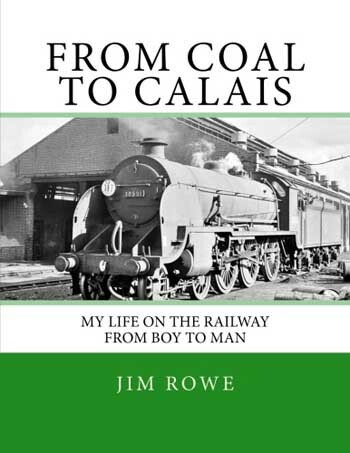 Written so descriptively by the author, Colin Robins, it covers his formative years that then lead up to the start of his railway career in 1950 at Crewkerne in Somerset. Subsequent Motive Power Department moves to Yeovil Town (72C), Basingstoke (old 70D), Salisbury (old 72B), Yeovil Pen Mill (old 82E later 71H) and finally Fratton (old 70F) enrich this account of one man's life and times. During your trip you will meet many unforgettable characters as the chapters unfold before you! It's like a time capsule, taking you back to an era of different values with which many of you will I'm sure align your own particular experiences of life. Initially it describes a view of the post war period by a then young railwayman. Some good, bad and indifferent times followed, all of it closely observed, recalled to mind and recounted in a manner that is both honest and enlightening. Several decisions that were made that then affected his railway future become evident as each change introduces yet another railway working environment. So let me recommend this fascinating insight into life during those times. Alas, all too soon railway changes took place that then erased a way of living that many believed would go on forever. Whatever, nostalgically turn the clock back and join the author on his reflective journey and share such wonderful times. Thoroughly absorbing! 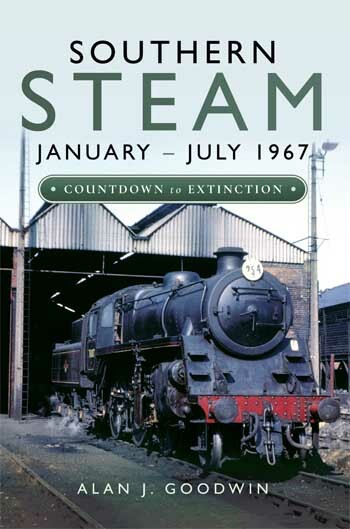 'YOU CAN'T TAKE THE STEAM OUT OF ME' by Colin Robins, ISBN 9780956764003. Includes 96 pages, 47 chapters, photographs from the period, maps and a gradient profile. This book is based on the author’s career with ‘British Railways’ from 1956 to 1995, a career spanning almost 40 years and moving through from Victorian steam locomotive technology to the age of computers, and even included a spell on the Waterloo & City. About 1954 Brian Aynsley discovered that there was a loco depot at Guildford and after that spent many happy hours watching the operations in and around that station. He was invited onto the footplate of an engine standing at the station and knew then when he left school he wanted to work on steam locomotives. 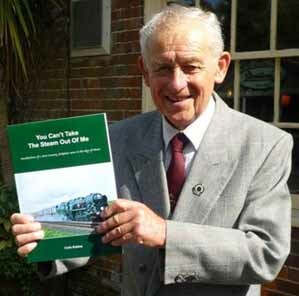 This book then tells the story of his ensuing railway career from engine cleaner at Guildford onwards. He witnessed the demise of steam, the arrival of new motive power and the eventual restructuring of the nation’s railway network. A5 format, 208 pages printed on art paper throughout, with 110 photographs. The book has a full colour laminated cover with a square-backed spine. DVD features a cab ride on board 75027 on the Bluebell Railway. The audio CD features sounds of a variety of UK locomotives. Bluebell Railway cab ride on 'U' Class 1638 on DVD. Go to Nine Elms Main Index - "Light to Loco"